Storypath » This is Not a Picture Book! Title: This Is Not a Picture Book! Summary: A young duckling finds a book lying on the ground, discovers with dismay that it has no pictures, kicks the book away in anger, apologizes to the book, and eventually opens it again, this time attempting to read the words. A small bug joins the duck for the adventures that ensue when the act of reading creates new worlds. Literary elements at work in the story: Irony abounds in this little book. Despite its title, it really is a picture book, but the pictures themselves constitute a song of praise to the power of reading. Weighing in at only eighty-six words, the written story is a short dialogue between a duckling and a bug about words and how they can affect a reader. Meanwhile, the illustrations change abruptly from stark white backgrounds in the early pages, when the duckling is wishing for a picture book, to wildly diverse scenes of imaginary places when the duckling begins to read. How does the perspective on gender/race/culture/economics/ability make a difference to the story? Not applicable in this book. Find the page where the duckling and bug have crossed a log into a brightly-colored place. Why do you think that there are suddenly so many wild and wonderful things to see? Whatever the duckling reads about seems to appear around him in the pictures. If he were reading the story of creation in the Bible, what sorts of things might appear? Can you name a Bible story that is sad? Name a Bible story that you would like to walk through, as the duckling does. Who would be in it? What would you hear and smell? What would you see? What stories from the Bible do you think will stay with you forever? Thank you to Beth Lyon-Suhring, Director of Christian Education at the St. Andrew Presbyterian Church, for this review. 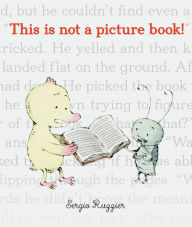 This is Not a Picture Book! by Storypath is licensed under a Creative Commons Attribution-NonCommercial 4.0 International License.